ROAD TOWN, Tortola — A passport, a bag of clothes, keys and a mobile phone: that is all Albert Wheatley salvaged from his wooden home in the British Virgin Islands as it collapsed around him last September when Hurricane Irma struck. Even the dead were not spared: at the main cemetery in the capital Road Town, exposed steel rods jut from damaged tombs, and several cement crosses lie fragmented and asymmetrical. Where Wheatley’s pink house once stood in Parham town, in the east of the main island of Tortola, weeds grow in a sea of rubble, and lizards sunbathe amid smashed mementoes. With this year’s hurricane season now underway, much of the BVI is scrambling to rebuild stronger structures. But for some residents like Wheatley, that has not been possible. The British overseas territory suffered some of the region’s worst damage last September as back-to-back hurricanes Irma and Maria tore through much of the archipelago. On Saturday, Hurricane Beryl, the first hurricane of the 2018 season – which runs from June 1 through to Nov. 30 – weakened back into a tropical storm, as it headed towards the Caribbean’s Lesser Antilles island chain, the U.S. National Hurricane Center said. The storm was expected to continue losing strength over the next 48 hours, it added. In the face of longer-term predictions that climate change could bring stronger hurricanes, the BVI authorities have been working on new building guidelines. “One of the phrases that we have used for this recovery is ‘build back better, stronger and greener’,” Premier Orlando Smith told the Thomson Reuters Foundation. The slogan – and variations on it – are hard to miss, appearing on roadside billboards, in social media posts and in officials’ speeches. 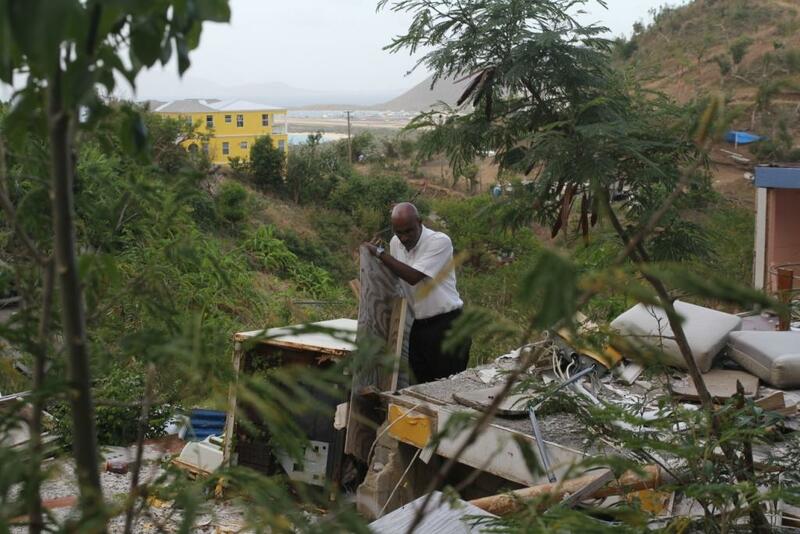 More than a third of the BVI’s 7,000 homes were destroyed or suffered major damage last year, according to the authorities, which estimate the hurricanes cost the territory $3.6 billion – three times its annual gross domestic product. In this tiny territory, whose population of 32,000 could fit in a football stadium, construction workers from across the Caribbean work marathon shifts. Orrett Lewis, 34, said he typically works 12 hours a day. “We do it because people need help,” he said. Around Road Town, home to most of the multi-island territory’s residents, empty shipping containers are a reminder that building supplies coming from Puerto Rico and the U.S. mainland cannot meet demand. Materials like windows, plywood and galvanized roofing used to take a month to reach customers, said Jillian Dookie, an employee at a local hardware store. But with shipping companies overwhelmed, they are often on a three-month schedule. Another challenge is that many residents lacked property insurance. In the most recent census in 2010, four in ten respondents who knew whether their dwelling was insured said it was not. Since the hurricanes, premiums – which were already pricey – have as much as doubled for those who filed claims, according to data provided by a BVI-based insurance company representative. Wheatley did have insurance and was paid out tens of thousands of dollars. But his bank refused to release the money and instead insisted it go to repay the outstanding mortgage on his ruined home and a small business loan, he said. The government employee, whose day job is helping tourists deal with crises during their stay, said the stress was so bad he had seen a therapist. “This level of insensitivity … It’s just crazy,” he said. The BVI’s current building regulations lack many specifics – from requirements for fire-rated windows to protective rail heights on different floors – said Greg Adams, who heads the Town and Country Planning Department. Those weaknesses are evident to the trained eye of Richard de Castro, an architect and senior lecturer at the H. Lavity Stoutt Community College outside Road Town. “You have to look at what happened to prevent the same thing from happening again,” he said, scrutinising shattered structures in Road Town. De Castro has seen all manner of failings: from buildings whose beams were not connected, to poorly-joined steel frames and sub-par windows that exploded when hit by winds. “I saw what I expected to see,” said the former government official. The new building code will be tailored for “extreme hazard events that are experienced in the Caribbean region more often due to climate change”, said Jose de Castro, deputy director of the Public Works Department and Richard de Castro’s son. But with just a half-dozen building inspectors, enforcing even the existing code is difficult, said the Ministry of Communications and Works. The U.S. National Oceanic and Atmospheric Administration’s Climate Prediction Center forecasts between one and four major hurricanes packing winds of 111 miles per hour (180 kph) could develop during the 2018 Atlantic hurricane season..
Angela Burnett, a BVI-based author who chronicled Irma’s destruction in “The Irma Diaries”, said many found the prospect of a repeat unbearable. “In people’s minds it’s like, ‘Well how many times can I restart my life?’”, she said. In a bid to help, the government set up a $15 million programme for residents who are behind in their rebuilding efforts, said Adrianna Soverall, a spokeswoman for the Ministry of Health and Social Development. “I’d say we’re 50 percent prepared,” she said, speaking of housing in Virgin Gorda, the nation’s second-largest island, where she lives. About 500 BVI households – most of them uninsured – had applied to the programme by early June, according to ministry data. Wheatley was among them, but said he had yet to hear back. The programme typically requires that applicants own the land on which their home was built. That counted out Kim Romney and her husband Tico, whose cottage stands yards from the beach in Cappoons Bay, a surf spot on the main island’s northwest shore. When a flash flood hit during Hurricane Irma, they had to swim out through their living room window. Lacking property insurance, they put their savings into a new wooden roof and some basics: a mattress, a fridge, an oven. The cheerful couple will ride out this year’s hurricane season without insurance. As a middle-class household, they could not afford it before Irma – now with premiums higher, it is even further out of reach.